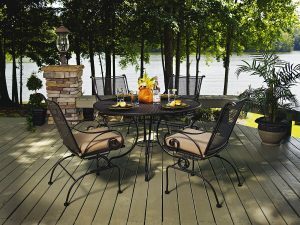 Wrought iron mesh chairs and tables were the original fast-drying, low maintenance outdoor furniture. Again, if you live in a windy spot, breezes go right through and the decorative, sturdy frames will stay put. There are some contemporary designs available now in wrought iron but the strength of this category is in traditional designs; graceful rods of iron accented with stamped floral embellishments. Wrought iron designs also include great seating options. A wrought iron sofa glider with pretty floral cushions on a breezeway in the summer—perfect! Wrought iron accent pieces like end tables or a spring chair make charming additions to a wicker collection or painted wood chairs. Don’t be afraid to experiment!